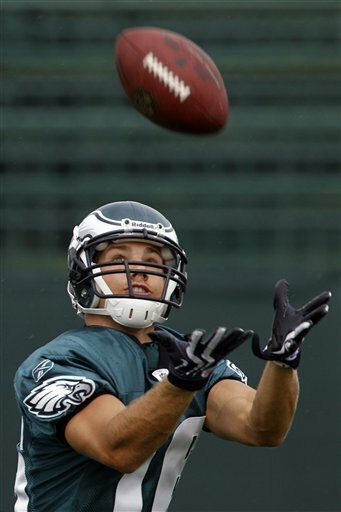 Air Force Academy alum Chad Hall just keeps catching passes in the NFL. A week after he caught his first NFL pass against San Francisco, Hall had another catch and a five-yard carry Sunday in the Eagles’ victory over the Atlanta Falcons. Last week reports came in that the Eagles had tried out receivers to potentially take his place last weekend, but there he was again, all 5-feet 8-inches of him. After wide receiver DeSean Jackson suffered a concussion and left the game, Eagles coach Andy Reid called Hall’s number on multiple three receiver sets. It looked like Hall might lose his spot on the active roster because rookie Riley Cooper is scheduled to return to practice Wednesday after he suffered a concussion of his own earlier this season. Now with Jackson out for an indefinite length of time after that vicious collision, it appears Hall will have more snaps to impress the Eagles coaching staff who showed a lot of trust in his ability Sunday. Colorado Springs Gazette columnist David Ramsey caught up with Hall after his NFL debut last week. “That’s what I’ve been waiting to do since my last game at Air Force. It was a great feeling, It made me feel capable, made me feel I can do it,” Hall told Ramsey. He also spoke with former Air Force coach Fisher DeBerry and Hall’s former running backs coach, Jemal Singleton. He has a great anecdote about Singleton racing out of his “man cave” to alert his wife to Hall’s first NFL catch in the third quarter. I admittedly missed Hall’s first catch, but I did listen to it thanks to a friend’s investment in XM radio. It’s clear that famed Eagles broadcaster Merrill Reese has taken quite a liking to Hall. Anytime he entered the game, Reese made sure to alert the radio audience, which doesn’t happen for 5th string receiver. We here at After Action have just one request of Hall: Update your Twitter feed, man. You just started your first two games in the NFL. If you are going to have a Twitter account, I would think you’d have a few thoughts on your first NFL catch.